As you know from my last post, my family was in town last weekend and I did some cooking for everyone, including brunch on Sunday morning. I had planned to have several items on the brunch menu, and I wanted one of the items to include eggs. So I searched around for an easy recipe that wouldn't take too much of my time (I wanted most of my time to be spent with the fam! ), was fairly healthy, and of course, delicious! 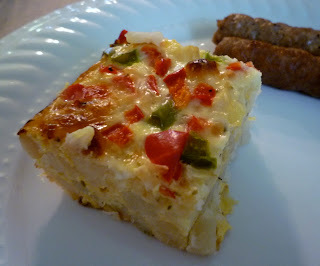 I settled upon this overnight egg casserole from Taste of Home. Luckily, it was a success! The original recipe says it makes nine servings, and although that would have been enough for us (there were six of us), I decided to increase the proportions just a bit for a few ingredients. This casserole is made in layers. I kept the bottom layer as is, by layering hash browns on the bottom of the pan. I used a 13 x 9 glass baking pan. I sprinkled some pepper and herbs de provence on the potatoes for a little extra flavor! I added about 4 or 4.5 cups of potatoes here. Next up comes the shredded cheese. I decided to use a combination of a mexican blend and Vermont sharp cheddar. About 1 cup total of shredded cheese (maybe slightly more than 1 cup) was sprinkled on top of the potatoes. The next step is to combine the eggs and evaporated milk. Although the recipe calls for 6 eggs, I used 8. I still used the 12 oz. can of evaporated milk called for in the recipe though; I did not increase the amount of milk. Now, a few ingredients I chose to add that weren't in the recipe were red pepper, green pepper, and onion! I wanted to add some healthy veggies AND some bright color. :) Mike chopped the veggies for me; thanks, Mike!! In total, we added about 1 cup of finely chopped red and green pepper and 1/2 of a yellow onion, finely chopped. These veggies got mixed in with the egg and milk mixture, as did some black pepper and more herbs de provence. The only thing left to do was pour the egg mixture overtop the potatoes and let the whole thing sit overnight in the fridge! That's all, folks. Super simple. The next morning I took the casserole out early so that it could sit for at least 30 minutes before baking. After baking it, uncovered, at 350 degrees for about 45 minutes, it was done! The recipe says to bake it for one hour or until a knife inserted in the center comes out clean; my oven tends to cook faster, so for me, it was done after just 45 minutes. How colorful! I love it. Overall, this dish was great and I would definitely make it again. My only concern was that the bottom hash brown layer was a tad dry, but not everyone who ate it thought so. So maybe that was just my own preferences talking! Maybe next time, if I made it again with 8 eggs rather than 6, I'd also increase the amount of evaporated milk. A couple additional items on our brunch menu were other tasty Barbershop recipes, including healthy carrot muffins and Irish soda bread scones. I'm getting hungry for brunch again as I type this. Uh oh! This looks really good! I make quiche quite often, so this looks like a good way to switch it up!